We know what you’re going through. We understand the IT obstacles that stand in your way. Our years of experience with businesses of all sizes have taught us how to handle IT challenges that range from the routine to the extraordinary. That’s why MIS Choice is there when you need us, with advice, guidance and vision. We can tackle the management of your IT projects from start to finish, from planning through implementation, from establishing new offices or workstations to optimizing existing ones. Our team includes experienced software architects, developers, customized programmers, web designers and more, so that every need is handled smartly and efficiently. Manage - we can oversee all aspects of your IT needs, from installation to day-to-day oversight, or provide support on demand. Align - we customize our approach to align seamlessly with your needs. Review - we constantly review processes and results to maximize your success. Team - we work collaboratively. Client input is critical to clearly defining success. 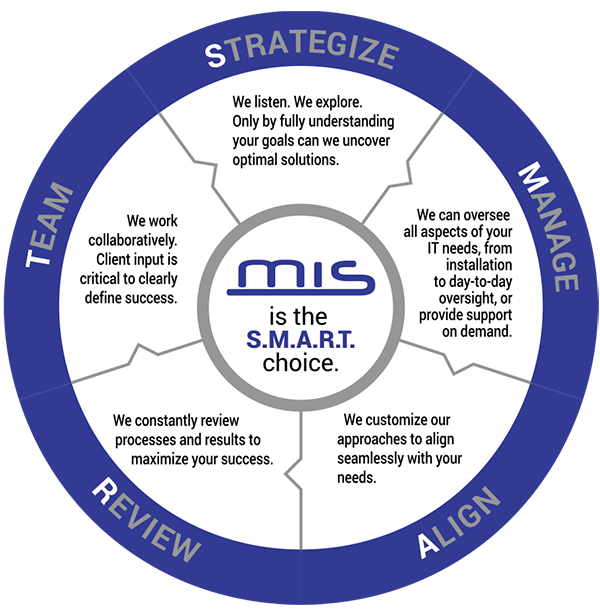 Whether your business is growing into new space, or you need to revamp your existing one, MIS Choice is the smart choice. We make sure we listen before we implement, and understand before we act, so that our solutions meet your needs seamlessly and your organization benefits the most. We help ensure your operations are more efficient, protected - and smart.